Brushed aluminum cases with glass lenses, available in two sizes; 10 inch diameter and 14 inch diameter. These are INDIVIDUAL CLOCKS that MOUNT ON YOUR WALL. Location names of your choosing can either be engraved on labels and mounted on your wall below the clocks, or printed right on the clock dials. 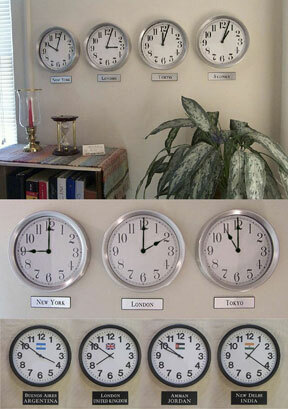 Only your wall space limits how many times zones you can display! Your choice of clock dials from 12 different designs. Alkaline batteries, wall anchors, instructions, time zone map and labels included ( for mounting method, labels can come with either double sided tape pre-applied, screw holes with screws or magnetic tape for easy label changes ). 10 inch diameter - $60.00 per clock plus shipping (minimum order - 2). 14 inch diameter - $75.00 per clock plus shipping (minimum order - 2). Add $15.00 per clock for flag dials. Add $8.00 per clock for oversized labels. 13" round x 2 1/2" deep, plastic cases and lenses. These are INDIVIDUAL CLOCKS that MOUNT ON YOUR WALL. The matching labels are mounted on your wall below the clocks. They are engraved with your choice or location names. 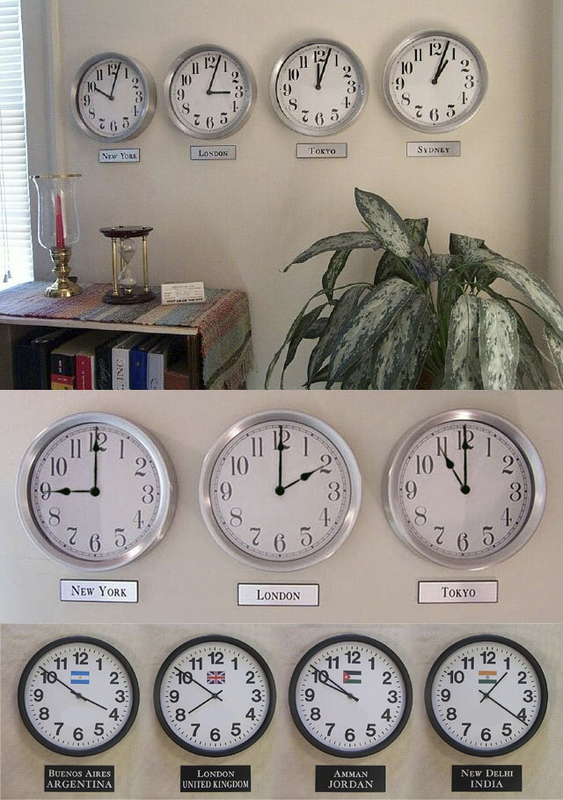 Only your wall space limits how many times zones you can display! Your choice of clock dials of 4 different clock dials with the AM/PM indicator. Includes batteries, wall anchors, instructions, time zone map and labels ( for mounting method, labels can come with either double sided tape pre-applied, screw holes with screws or magnetic tape for easy label changes ). 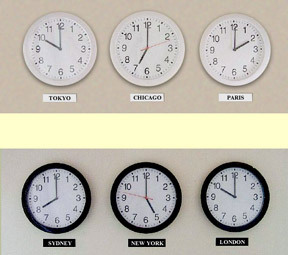 Comes in 2 different sizes: 12" (black or white, hard plastic case) and 14" (black case only); these are for INDIVIDUAL MOUNTING ON YOUR WALL; The matching labels are engraved with your designated cities or countries ( come with adhesive backing or small brad holes for mounting on your wall below the clocks ). Only your wall space limits how many times zones you can exhibit! Accurate battery quartz movement; each clock uses one AA battery; red second hand on one clock if desired for drawing attention to your local time. Batteries, wall anchors, instructions and time zone map included.